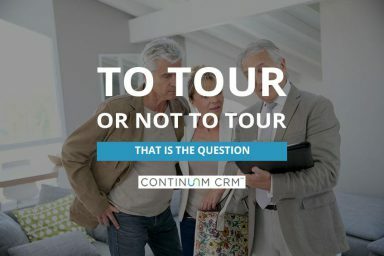 Do prospects tour your senior living community or do they visit? You might not think there’s much of a difference, but there is. Learn why you need to host visits instead of giving tours and how best to make very prospect’s visit a memorable one. 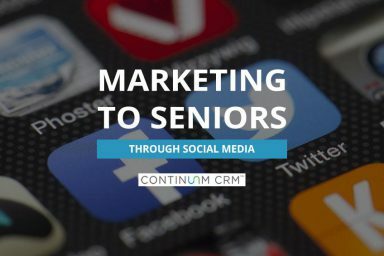 Social media has quickly become an important channel for marketing your senior living community. Seniors are a growing segment of social media users, but reaching them can be a challenge with so many platforms to consider and ways to engage. When looking for an assisted living community, seniors and their adult children are looking for two things: information and reassurance. Does your marketing provide both? Or do prospects have to jump through hoops to find critical information about your community? 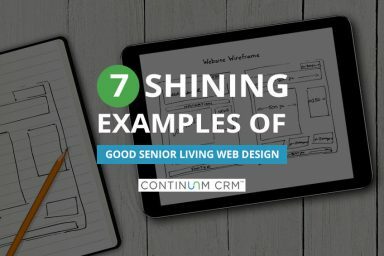 Good senior living web design achieves a balance between visual appeal and easy to use functionality. Easier said than done. Plenty of senior living communities get it right, though. If you’re looking for inspiration, check out these great senior living community websites. 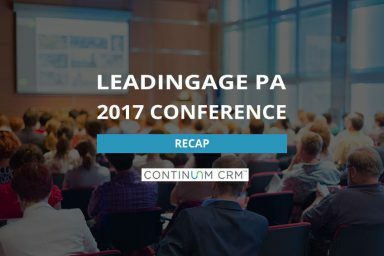 LeadingAge PA, a trade association representing Pennsylvania non-profit organizations that provide services to the elderly, holds an annual conference and expo. This year, Continuum CRM staffers were on hand for the event. Read Scott Farmer’s recap here. It’s summertime and the selling is easy. But what happens at the end of the summer when the living is not so easy? Does your pipeline dry up? 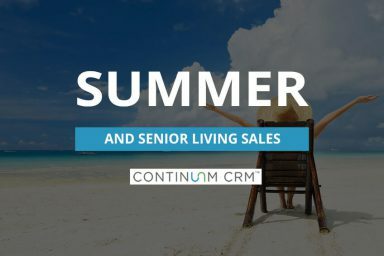 If you want to maintain a healthy sales funnel all year long, what you do during the summer can have a major impact. 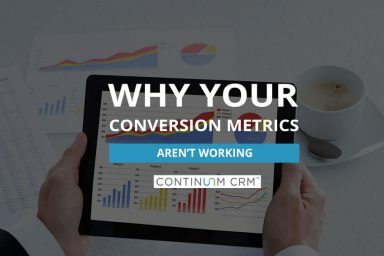 Is your CRM system just a tool for looking backwards? Can you create accurate forecast reports based on statistical analysis or are you stuck looking at the past and making your best guess at what might happen later? 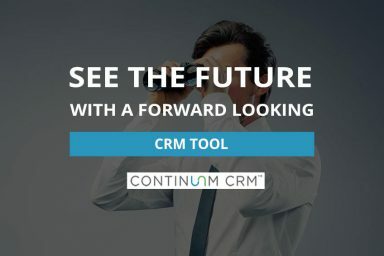 Learn what a forward looking CRM tool can do for you. Traditional conversion metrics leave a lot to be desired. Successful senior living sales is about teamwork, lead nurturing, and relationship building. But you might not be measuring these things accurately. Learn what you should be looking at here. 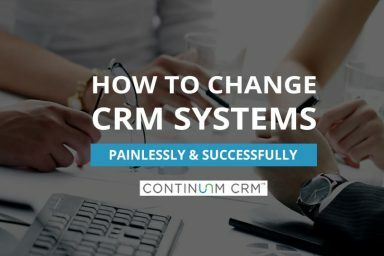 Transitioning from one CRM system to another can be a difficult challenge filled with roadblocks, resistance, and technical problems. But it doesn’t have to be that way. Learn how to manage the changes and avoid the common obstacles that get in the way of a smooth transition. 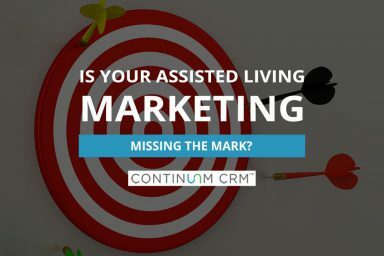 If you’re trying to pick a CRM tool for your Senior Living community or CCRC, it’s easy to get lost in a sea of confusing terminology. A word might mean one thing to you, but something entirely different to someone else. 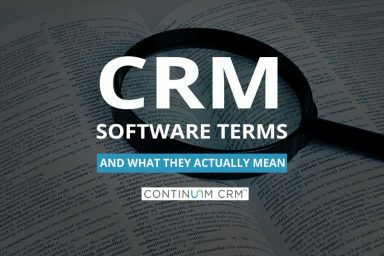 Learn what several common CRM terms really mean.